Fractions For Kids Makes Understanding Math Easy For Young Learners. Fractions for kids - teaching all about fractions with fun activities! Here's a fraction activity that's great for the classroom or at home. All you have to do is print off the score card and grab some paper and waste baskets and you're ready to play! Each team places a waste basket (container) the same distance away from a point, that will be the shooting line. Place a piece of tape to mark off this shooting line. You should use a tape measure or yard stick to make sure the distance is the same for each team's shooting line to their basket. Decide which team will go first. One at a time, each member of the first team team will stand at the shooting line and try to shoot the crumpled paper into their basket. 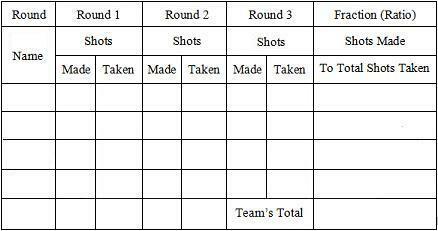 After every shot attempt, each team fills out their score sheet in the appropriate space by their name. The team with the highest score wins the game. Fraction games give kids the opportunity to see how fractions can be used in a practical way as it relates to a game their involved in. We are also working on our "Fabulous Fractions" ebook of fraction activities to help kids conquer fractions. It will take them from the basics up through the higher level fraction skills. Be sure to sign up for he free newsletter if you would like us to let you know as soon as it comes out. Students will be able to see how fractions with different denominators are equivalent.